For 39 straight years, Wright State University’s delegates have earned top awards at the National Model United Nations Conference—a winning streak unmatched by any other university. The Wright State University Model United Nations program is more than a club, and more than a class. It is a team built on hard work, camaraderie, and a shared commitment to excellence. The Model United Nations program at Wright State is built around a three credit hour spring semester course in Political Science. PLS 4860/6860 emphasizes skills of teamwork, problem-solving, diplomacy, public speaking, technical writing, and researching. Team members are chosen on the basis of a written application and oral interview. Model U.N. is open to students in good academic standing from all majors and colleges. No previous experience is required. Your success as a team member is based on the improvement of your writing skills, speaking abilities, attendance and ability to portray another country's policy in a simulation. 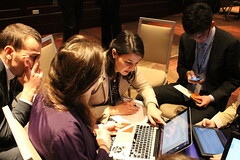 The seminar is used to prepare students for the week-long National Model United Nations Conference, held in New York City. Universities from around the world are each assigned a country to represent at the conference dealing with various topics and issues. During the class, students develop research techniques and master the skills of public speaking, negotiation, and technical writing that are essential to diplomacy. Research for the conference in New York begins Fall semester and continues through the Spring term. To help prepare for the week-long conference, we schedule regional practice simulations with other schools. These include a Wright State-hosted practice conference in January, and the Dayton Model United Nations Conference (DAYMUNC) held at Sinclair Community College in February. Each year the conference has grown in size and international participation. 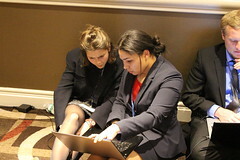 More than 5,200 students from more than 400 colleges and universities from nearly 30 countries around the world have taken part in recent NMUN conferences. The Model U.N. experience is a unique academic experience at Wright State. 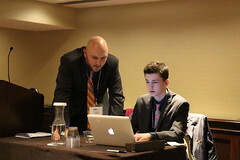 Model UN promotes self-confidence, public speaking, writing, researching, and diplomatic skills, all of which are vital qualities for any future career. To learn more read Model UN: 'A tradition of excellence' in the Wright State Newsroom. New member recruitment takes place September and October of Fall Semester each year. Joining the team is a three-step process: an application, essay, and an interview. In addition to the application, you must write a brief 1-2 page essay explaining why you want to join the Model United Nations Team and what you have to offer the Team. Third, an interview signup sheet will be posted in the School of Public and International Affairs office by mid-September and you must sign up for one of the available slots. Interviews will take place the first week of October. The interview will include a brief role-play of a diplomat from an assigned country on an announced topic, which will be described in detail on the application. You will be able to research the topic and country's policy. The selection processed is closed for 2018/19. Be on the lookout early Fall 2019 for the next application. Welcome to Alumni Notes. All alumni of Wright State University Model United Nations Program can view or submit alumni notes at any time. You may submit your own class note by e-mailing your name, MUN class year and any relevant information about your life and career, including marriages, births announcements, and accomplishments, along with associated pictures. For more information, please see our official Model UN Alumni Facebook page. "The Wright State Model UN experience was the best experiences of my time at WSU. The critical-thinking, research and public speaking skills I acquired have helped me succeed in my career. 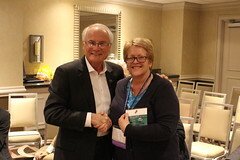 I continue to serve as a member and board member of the Model UN Alumni Association because the experience continues to pay dividends for my professional development. I'd also encourage other former members to get involved with the work of the Association." 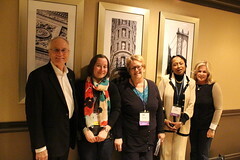 Due to the rising costs of participating in the five-day conference in New York City, the program has recently had to reduce the number of students who can participate. Your gift to the MUN Program Fund will help increase the endowment and will enable more students to participate each year. Please consider impacting MUN students' lives and make your gift to the Wright State Model United Nations Program today. "There is no other place to work in the world like the daily environment that exists working in Washington, D.C. The research, negotiation, and presentation skills we learned as members of the Wright State University Model United Nations team prepared us both to build successful careers in Washington in the corporate, political, and government jobs we've held over the years. So that this tradition of excellence in developing our next leaders may continue, please consider a gift to the Wright State University Model United Nations Program Fund." “Over the years, Wright State’s MUN program has built a winning tradition. 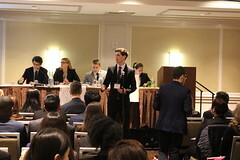 The challenges and rewards of teamwork,learning to compromise and negotiate, and awareness of the numerous issues of the 21st century are among the manyimportant skills MUN students carry into their future careers." *If you are interested in making a gift of $25,000 or more, please contact Sara Woodhull, University Advancement at (937) 775-4921. 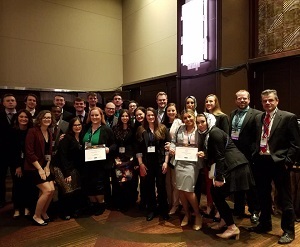 For the 40th consecutive year, Wright State University’s Model United Nations team won top honors at the National Model UN Conference March 24-28 in New York City. Two-time Wright State grad James Mosher has worked around the world as part of the U.S. Foreign Service. The Wright State Model UN team received an Outstanding Delegation Award and numerous student won individual honors in the annual competition. For the last 38th years, Wright State's Model United Nations team has earned a delegation award at the annual national conference in New York City. The ceremony begins at 10 a.m. on Saturday, April 29, in the Wright State Nutter Center. 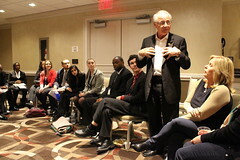 Wright State's Model UN team was named an Outstanding Delegation at the national conference in New York City. Wright State students will represent the candidates’ views during a mock presidential debate on Sept. 13. For 37 consecutive years, Wright State's Model United Nations team has earned a delegation award at the national conference in New York City. 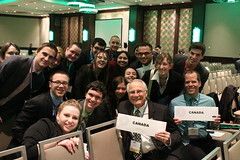 Wright State received a Distinguished Delegation award at the National Model United Nations Conference March 27-31. Joshua Cummins, who has degrees in history and international and comparative politics from Wright State, received first-hand lessons on the Persian Gulf nation of Qatar during a fellowship.